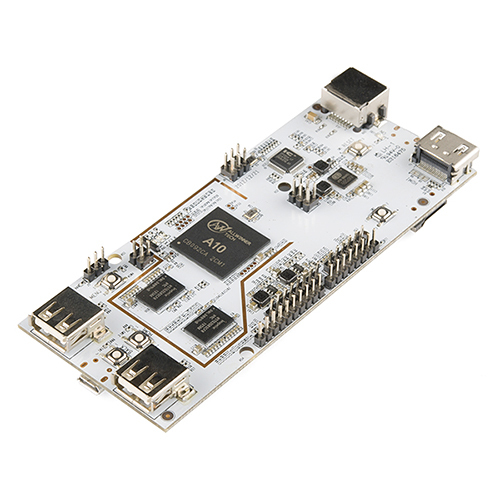 New Product Friday: The pcDuino is here! Once again we're back with more new products, another installment of Shieldstravaganza, and a video for the new pcDuino. Oh, is it Friday already? Believe it or not, it is. As always, we have some exciting new products for you this week. We've also got the next installment of SHIELDSTRAVAGANZA! If you're not sure what that word is, check out part one of the video last week. The pcDuino warrants its own video this week, so we had Mike shoot a special video to get you started. Check it out! The pcDuino is a pretty exciting board. It can do just about anything you might want. For those of you looking at a Raspberry Pi, but wanting a bit more, you should check out the pcDuino. Not only can it run Ubuntu and/or Android (yes, and/or) you can connect Arduino shields to it, connect it to your network, and more. Check out the video above for more information on what it can do and how to get started. 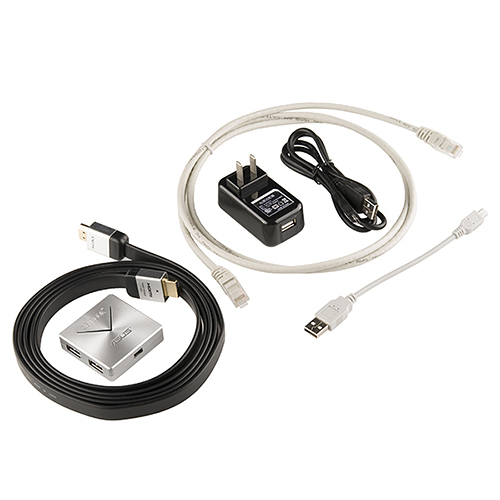 If you don't already have all the cables and such that you need for the pcDuino, check out the AV Kit. It includes an HDMI cable, power adapter, ethernet cable, USB cable, and even a USB hub. It's a simple way to get everything you need to start playing with the pcDuino. Everyone loves a good dongle. Check out the new WiFi dongle for the pcDuino. 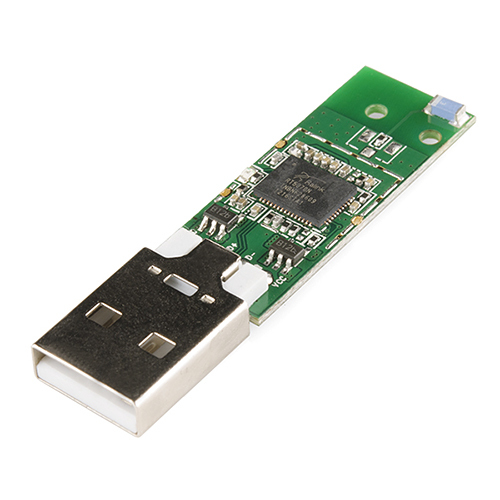 Just plug it into an open USB port and you can start using the dev board on your WiFi network. It's made just for the pcDuino so you don't need to mess around with compatibility or drivers. 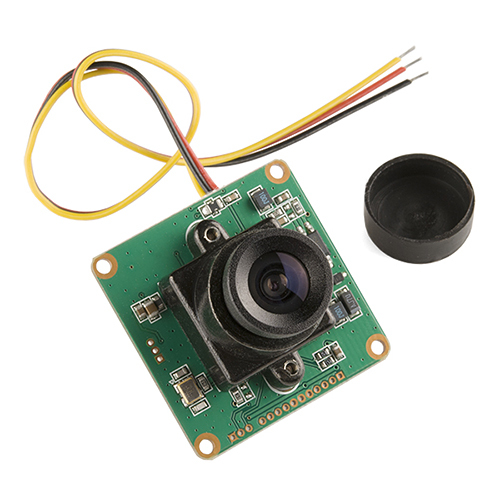 We have a new CMOS camera module this week as well. It's very similar to our 640x480 camera but with a bit higher resolution (728x488). Check out the video above for a demonstration of its video quality. 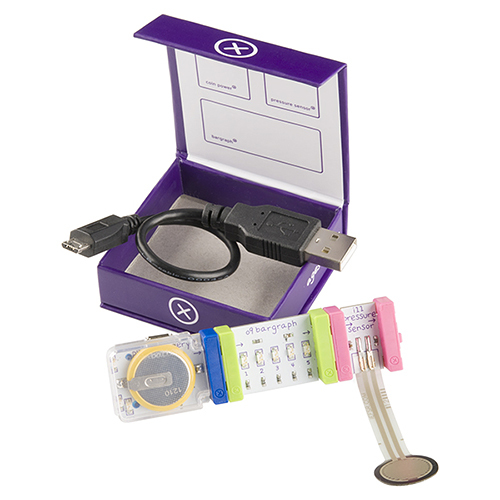 If you're not quite ready to get the full littleBits Starter Kit, you might want to check out the Teaser Kit, which has only 3 bits (as opposed to the 10 you get in the full kit) to get you started. We have a new ultrasonic range finder from Maxbotix this week. This one is an update to the XL-WR1. 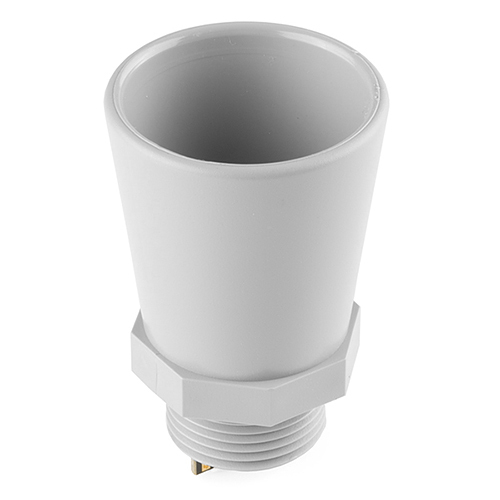 The MB7360 is made for outdoor applications and has a 1mm resolution. We have a set of screws. These were leftover from out last version of the BigTime Watch. 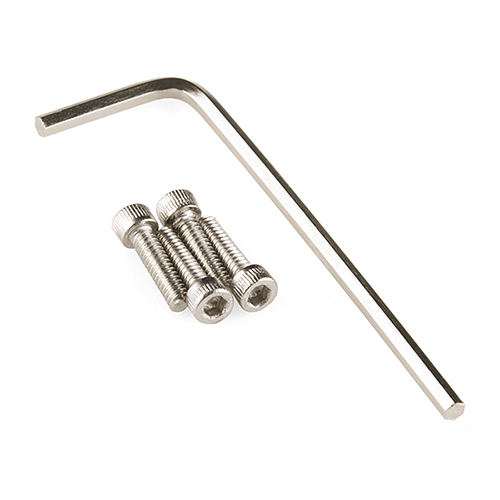 The pack includes 4 screws and a hex key for the turnin'. Get them while they last, we won't be restocking them! And finally, we have a revision of the Si4735 AM/FM radio IC. This is the D60-GU, whereas the old one we were carrying was the C40-GU. 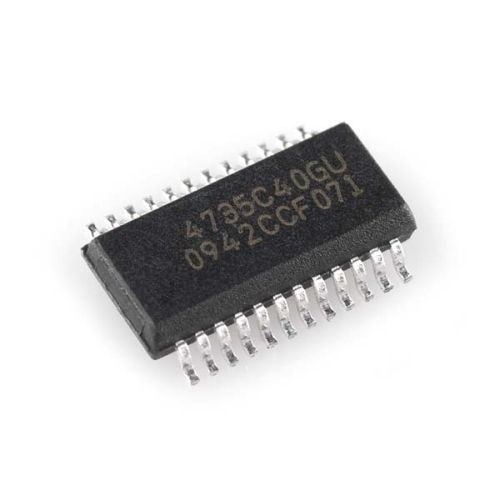 The new version is essentially the same, but can be used as an ADC with an analog input. It's an interesting feature to see on an AM/FM radio IC. Mike - nice intro, though I'd like to hear some more tech specs (cpu/mem/gpio). ... and who says only Adafruit people can rock the nail polish! My personal favorite feature is that the board will boot from the SD card OR the flash, so I can have Linux loaded on the flash and then just insert an SD card with the Android image if I want to boot Android. we'll be doing a more in-depth video in the future that goes into more details. Agreed. I'd like to see more videos on the pcDuino, but not if I have to see that again. "Everyone loves a good dongle." Made me giggle. That aside, would this WiFi dongle work with the Raspberry Pi? check the product page, I think someone commented that it might work. pcDuino looks pretty cool. Currently I've been playing with the Rpi a lot and this may be the next step. Same here....hmmm...price vs. hardware.....eh what the hell, why not both! In the part 2 of the Shieldstravaganza, Robert talk about the ethernet shields. The first one (at 0:55) is the Sparfun PoEthernet shield. (DEV-10864). The second one (at 5:20) is the oficial Arduno Shield with de PoE Module. (DEV-11230). The Sparksfun shield uses pasive "unoficial" PoE, inyecting power over the 7,8 (+) and the 4,5 (-) pins. You still need a PoE inyector and a power source to put the power in the ethernet cable. The Arduino shield uses the "standart" IEEE 802.3af. This way, uses a PoE source (mainly ethernet switch) to put the power in the cable. This schema modulates the data using the same cables used to the PoE. In gigabit ethernet, all 4 pairs are used, and still is posible to use "official" PoE. Those two ways to build a PoE circuit are compleatly diferent, and not compatible. After seeing the pcDuino video I had to shake my head, you guys are professional outfit, it's not a nice display showing a male with nail polish. I don't know if this was done on purpose or the guy is just a weido but you should have chosen a lady's hand instead. Otherwise the pcDuino looks like a nice product. After seeing the pcDuino video I had to shake my head, you guys are professional outfit, itâs not a nice display showing a male with nail polish. I donât know if this was done on purpose or the guy is just a weido but you should have chosen a ladyâs hand instead. In the unlikely event that anyone is hanging on to an image of SparkFun Electronics as an operation in carefully maintained conformity with the professional norms of the American 1950s, this might be kind of upsetting, but the truth is that we are pretty much all weirdos. I have been referring to this place as a sort of nerd Island of Misfit Toys for just about as long as I've worked here. It makes me a happier person to spend my professional life around people who are at least as weird as I am. Visit some time, if you happen to find yourself in CO. Aside from nail polish, you would also find that the building contains dudes with weird hair and obvious piercings, people with tattoos, poets, dancers, acrobats, gearheads, people in metal bands, a noticeable dearth of dress code, and women who have things to do with their time besides holding products in videos. At the late date of 2013, none of this makes this all that special as a workplace in the tech field. I'd just have a hard time accepting less general tolerance from an employer. If some nail polish bothers you enough to call us unprofessional, SparkFun may not be the web-based retailer for you. Every so often, our CEO Nate holds a company-wide meeting asking the employees of SparkFun what's important to them. Not just respect, but appreciation for individuality is always high on the list, which makes me proud to be working here. I'll also mention that Mike is a damn good engineer who has really raised our game; I don't know how he does that while keeping his nails so lovely. I enjoy working with articulate, smart people, regardless of their choice of color in nail polish. Oh! You had a problem with the nail polish. That's just Mike. He's a wicked good engineer. I wouldn't want it any other way. weird hair, here, reporting in to say "hear hear"
That is why sparkfun is the best place ever. The community is the best. Obviously we have a age difference here, which brings different opinions. The fact people having tattoos, piecing, weird hair etc. is not a problem for me I work with these type of people all the time and many of my friends are that nature. The mistake I made was I should not have used the word 'weido' about the guy who presented it. My comments where not made directly to/about the Sparkfun Community but you may not be mature enough to understand that, I commented on the presentation of the video. "My comments where not made directly to/about the Sparkfun Community"
Maybe it would have been better to send comments directly to SF? Posting up in a public forum implies that the comment is intended for the general populous to read and respond to. As you pointed out calling the guy a 'weirdo' was probably not the best adjective and it isn't surprising people responded defensively (especially the people who work with him). Alienating your customer base is unprofessional. Maybe Sparkfun isn't the web-based retailer for me. It's not alienating, he's just saying if you don't like the community you're surrounded by, then you don't have to be here. There are many others out there that describe the "professional" and un-fun retailer you wish to use. I'm staying with the great community who have taught me an unthinkable amount. Looks like you appreciate a "nice product" but not a nice nail polish job. No brush marks! The guy is there to demonstrate a product. It doesn't matter what his hands look like. Personally, I thought it was rather cool, but that's me. It did not affect his demoing the product. I agree, variety is the spice of life after all. What should we wear? Grey suits, black ties and white shirts - all well starched and ironed of course. SF has always been a funky place in my head,not some stuffy old company stuck in the 1950s. If the guy had a Clown suit on or they made his hand look like some hairy monster, it would not matter as you would know (or think)it was done in humour, but a real hand made to looke like that seemed a bit different.... Sorry it could be just me but that was my original impression. Hay each to his own :o) Just ordered one, not sure yet what it will be used for though!!! Why can't the AM/FM IC's of 20 years finally get upgraded to receive all the HAM radio bands? Please stop trying to be cute with the video transitions. All the pulling of focus and panning into products is making me nauseous! Straight cuts work very well and look more professional. I liked it, added a bit of variety :o) Maybe over used a bit, only use as the product is first shown close up? Much better then the hard and many cuts you see in lots of video blogs these days. Gives the eyes a chance to gently find the subject of the frame I think. Who's the hand model with the hairy arms and blue nail polish? That would be Mike, who is, you know, the person in the video. I'm now going to suggest that he get a run of business cards printed with "Engineer / Hand Model" for the title. Or maybe shave the arms + hands. Or, you know, don't - and wear whatever nail polish you like, Mike. Given that a bunch of comments (here/youtube/IRC even) seem to concentrate on the nails / arm hair rather than the product, I could understand if SFE would choose a different presenter in the future (though I hope they won't). But Mike, the person? He should do and wear whatever he feels most comfortable with.